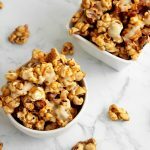 This hot cross bun popcorn recipe is perfect for the Easter period, though I like to enjoy it any time of the year! It’s a quick, easy and fun little snack to throw together with the kiddies or to serve at parties that is impressive, cute and delicious! 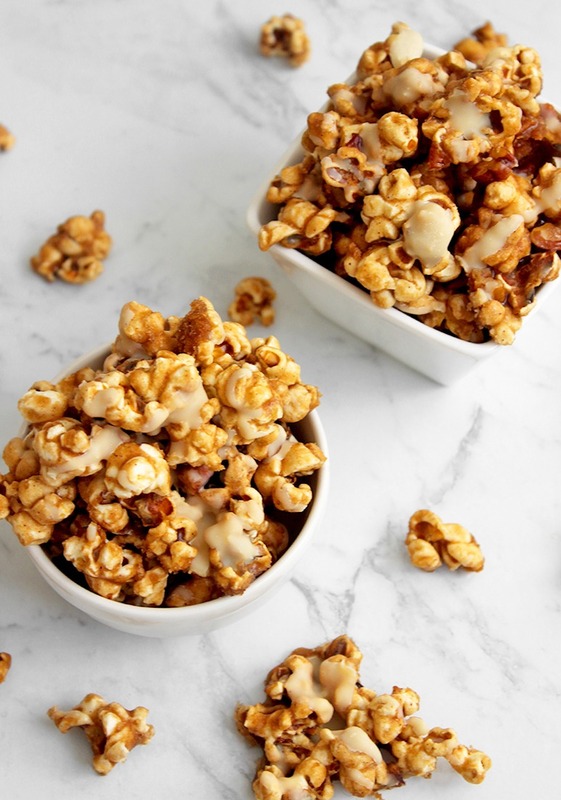 Tasty popcorn coated in sweet golden caramel, mixed with pecans and drizzled with vegan white chocolate… who could go wrong! 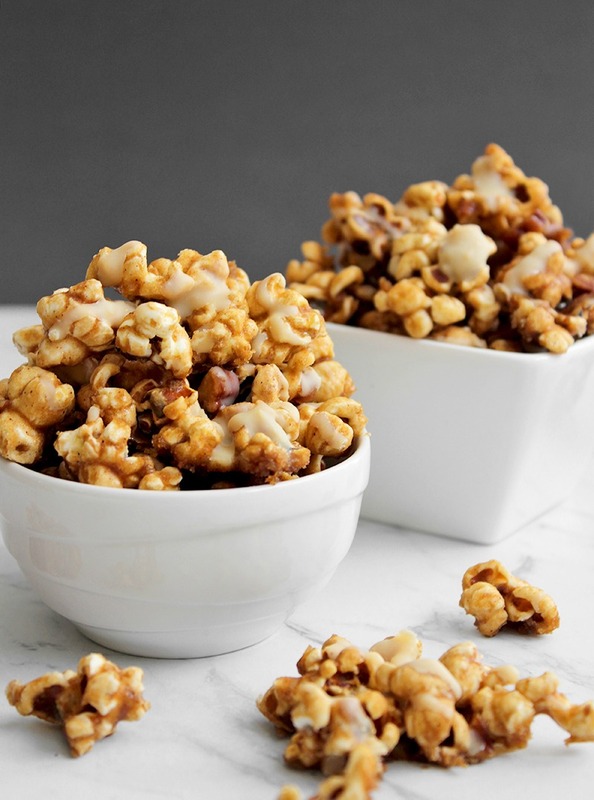 This popcorn recipe involves a golden caramel sauce with cinnamon and nutmeg, chopped pecans and, the star of the show, melted white chocolate drizzled over the top to create that hot cross bun resemblance! The taste is on point and I find popcorn to be such a cute little food and love using it to dress up other desserts or serve on its own. This popcorn is made in 5 super simple steps! This step simply involves either putting your popcorn bag in the microwave or, if you’re using loose popcorn kernels like me, popping them in a pan with some oil over medium heat, occasionally shaking it until they’ve popped. Now you can chop your pecans and any other nuts, raisins or whatever else you’d like to add to your popcorn to jazz it up even more and set aside. Microwave version: In a large microwave-safe mixing bowl add the caramel ingredients and heat for 30 seconds or until everything is melted, whisk as you add in the baking soda. Now add the popcorn from the pan into the mixing bowl with the caramel and mix until it’s well coated. Spread over a tray that you can fit in the fridge and sprinkle your add-ins over the top. Stovetop version: Move the popcorn to a large mixing bowl and add all the caramel ingredients into the pan you used for the popcorn, whisk until it’s melted over low-medium heat, then whisk in the baking soda. Pour this over the popcorn and mix until it’s well coated. Spread over a tray that you can fit in the fridge and sprinkle your add-ins over the top. Melt your white chocolate and drizzle this lightly over the tray of popcorn. You could also use dark chocolate or mix the two. Set the tray of popcorn in the fridge for 1-2 hours or until the caramel and chocolate have set. Spoon it into a container, glass jar or serving vessel and enjoy! If you’re after more vegan Easter or snack recipes, check out my Mini Carrot Cakes with Cashew Coconut Icing and my No-bake Coconut Lemon Slice! 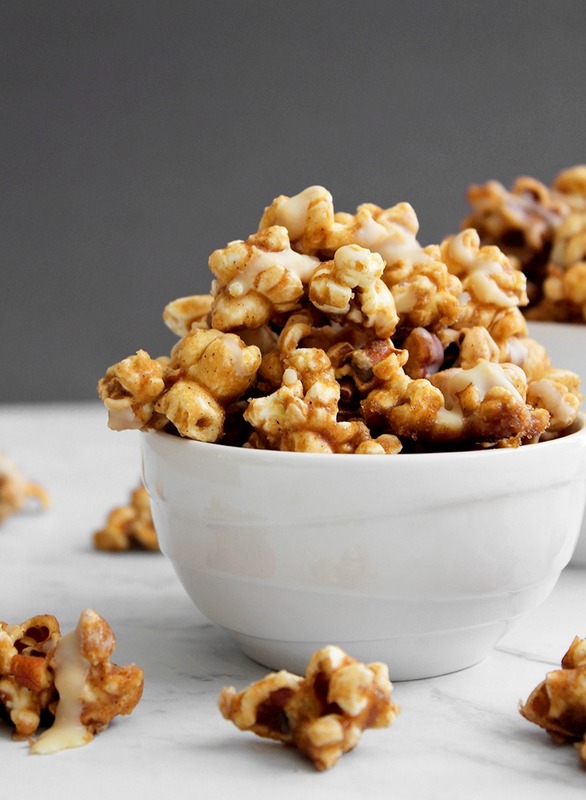 Planning to make this Hot Cross Bun Popcorn? Share your pics with me on Instagram @lemonthy.me! Place your popcorn bag in the microwave or, if you’re using loose popcorn kernels as I did, pop them in a pan with the coconut oil over medium heat, occasionally shaking them until they’ve popped. Chop your pecans and any other nuts, raisins or whatever else you’d like to add to your popcorn and set aside. Microwave caramel: In a large microwave-safe mixing bowl add the caramel ingredients (cinnamon, nutmeg, brown sugar, maple syrup & butter) and heat for 30 seconds or until everything is melted, whisk as you add in the baking soda. Now add the popcorn from the pan into the mixing bowl with the caramel and mix until it’s well coated. Spread over a tray that you can fit in the fridge and sprinkle your add-ins over the top. 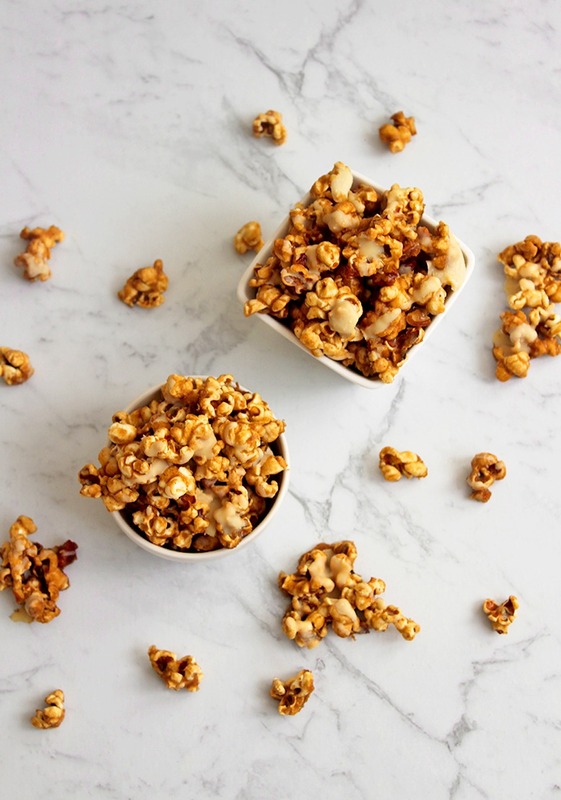 Stovetop caramel: Move the popcorn to a large mixing bowl and add all the caramel ingredients (cinnamon, nutmeg, brown sugar, maple syrup & butter) into the pan you used for the popcorn, whisk until it’s melted over low-medium heat then whisk in the baking soda. Pour this over the popcorn and mix until it’s well coated. Spread over a tray that you can fit in the fridge and sprinkle your add-ins over the top. Melt your white chocolate and drizzle this lightly over the spread out popcorn. You could also use dark chocolate or mix the two.